Description of "Origin and Fate of Universe"
Combining epistemology study of its ancient text with scientific research, the researcher reveals from Quran, a picture of universe much more interesting and mysterious than any fictional narrative. The information is presented in a grid like structure, and is composed in a way which would help in the progressive scientific development of the world and also corroborate components connected to deeper pointers at the same time. 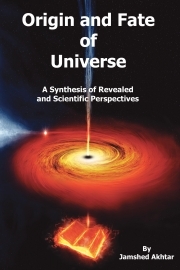 In this second book of a series, more hints from Quran have been presented that point towards a Super String based cyclic Universe, teeming with 'life and Intelligence' at different levels of maturity, and unfolding according to a 'mother of all programs’. The revelations also reveal the existence of a dynamic mechanism for administration of universe with a ‘Federation of Intellects’ at highest levels. The research asserts that man will outlive his planet of origin, surviving long in the universe; and resolves several difficulties in the standard scientific models. The Creator, emerging from the literal interpretation of verses, differs from the ‘man in His image’ concept, and covers many universes, spread over levels upon levels of existence and perception. Jamshed Akhtar (born 1947) is a writer and researcher from India. A graduate in Electrical Engineering, he is involved in the scientific study of religion for last 34 years, and has written three books on this topic. Akhtar’s primary interest is the Quran. He claims that the language of Quran has a distinct meaning for each word and suggests using root meanings of words as understood by Bedouins of the era, to extract information from the original text. Utilizing this method, he has presented hundreds of evidences to support non-human origin of the phenomenon of revelations. Apart from his interest in science and religion, he is also involved in social and educational causes with various organizations in India. Reviews of "Origin and Fate of Universe"